Ribs are all alike, so when you’re sorting through them at the grocery store, just grab the most affordable package and go. Wrong! There are serious differences among ribs and they require different cooking methods and times, and will produce different flavors and textures. If you want to impress family and friends with your rib skills, then it’s best to recognize the differences and know how to address them. First things first, there are two main categories of pork ribs: back and spare. This cut tends to be meatier as well as more tender. These are taken from the loin region of the pig, which runs along the back between shoulders and legs. The ribs are characterized by smaller bones and a more rounded shape in the cross section. Sometimes called side ribs, spare ribs come more from the belly area of the pig, and therefore, tend to have more fat than back ribs, but that fat equals flavor. In addition to these two cuts, there are a few variations. 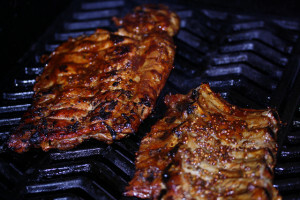 For example, St. Louis-style ribs are spare ribs with the breast bone removed and flank meat cut away. Country style ribs come from the loin, but are usually meatier than back ribs. Tip: When planning on serving ribs, estimate at least one pound per person. Of course, if you’re cooking for big-time barbecue fans, you can always up that amount. Before firing up the oven or grill, prep your ribs. If the membrane on the underside of the bones is still intact, remove it by slipping a spoon handle under a corner to separate a section. Grab that section and carefully pull it back. The membrane should come off in one clean motion. Now season the ribs. If you prefer a dry, smoky treatment, rub in a spice mixture like this one from Dr. BBQ. Combine ingredients in a food processor and process for 5 seconds until lumps are gone. Note: This rub is intended for slow cooking at low temperatures to keep the sugar from burning. If you are more of a barbecue sauce person, season the meat with a generous amount of salt and pepper and cook. Save the sauce for the last 15 to 30 minutes to keep the sugar in it from burning. For the best sauce coverage, baste both sides several times. If you’re planning on grilling, use an indirect heat, which means the meat is not directly over the coals or flame. For charcoal grills, move the hot coals either all into the center and place the meat on the perimeter of the grill, or vice versa. Heat up a gas grill to 250 degrees, then turn off one burner; which is where the meat will sit. When cooking ribs in the oven, season the meat before adding it to a roasting pan with about ½ an inch of water. Throw in onions, garlic, carrots or fruit, cover with foil and cook at 325 degrees. Ribs take a few hours to cook regardless of which heat source you choose. To be sure they’re thoroughly cooked, test the meat’s internal temperature with an instance-read thermometer; it should settle between 180 and 190 degrees. Now grab lots of napkins, and enjoy.